Oh, you guys! YOU GUYS! You. Guys. This is the best butternut squash I’ve ever eaten in my entire life. I mean it. I don’t know if it’s just that I’d been nauseous and eaten only cereal and fruit for 3 days before eating this, but this squash was heaven in my mouth. Every little gem I popped in my mouth tasted better than the last, and I ended up having a giant bowl for dinner that night. This would make a beautiful (and tasty, did I mention tasty?) Thanksgiving side dish if you’re looking for something that won’t occupy precious oven space on the big day. We enjoyed it as part of a meatless meal comprised of lots of delicious fall fruits and vegetables. If you’re not yet a browned butter convert, please consider this recipe as a great gateway. Before you know it, you’ll be making brownies, chocolate chip cookies, iced oatmeal cookies, and more. If nothing else, this might even make a squash convert of any haters in your family. Michael is not a squash person, but the not-too-squishy texture of the saute + caramelize method combined with the liquid gold that is the sauce made him think twice. Also, I’d like to point out that, even though the words “browned butter” are in the title, there are only 2 tablespoons of butter for almost 2 pounds of squash, which I don’t think is that bad a ratio. 2. Make this right now. No, really. Right. Now. p.s. New to butternut squash? I use this method for peeling and dicing it. It’s the best I’ve ever tried. Melt butter in a large saute pan over medium heat. Continue cooking until butter has browned and smells nutty/caramel-y. 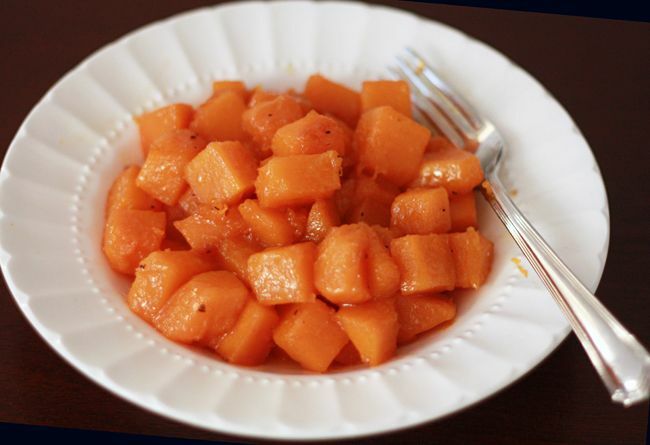 Add squash cubes to the pan and toss to coat (careful of spatters!). Saute squash over medium heat until easily able to be pierced with a fork, about 15 minutes (depending on size of cubes). Add water and brown sugar to the pan and bring to a boil over medium-high heat. Continue cooking until liquid is almost entirely absorbed and squash is caramelized, about 5-10 minutes longer. Salt and pepper to taste. 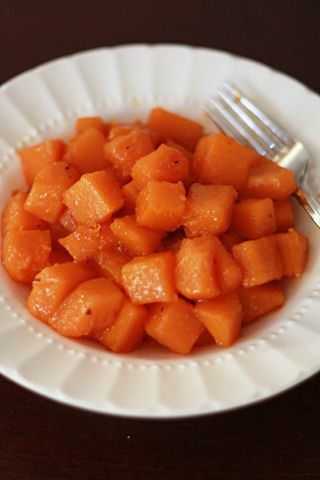 Squash can be peeled, seeded, and diced a day ahead of time for easier preparation on the day you plan on cooking it. Dice and store in an airtight container or plastic zip-top bag in the refrigerator until ready to cook. I’m actually cooking a butternut squash for breakfast this morning. (I’m embarrassing, I LOVE squash for breakfast!) Thankfully, I have an additional squash on my counter just waiting for a new way to prepare it. Well, we are thinking alike. When the kids get put down for naps today, I was already thinking of cooking up a butternut squash…just wasn’t sure how. Thanks so much! Brown butter is definitely magic sauce. I love this, Emily! I’m so glad you didn’t over sweeten this dish; it’s perfect! I have never had butternut squash before, let alone cook it, but you have inspired me! I bought one at the grocery store today!! 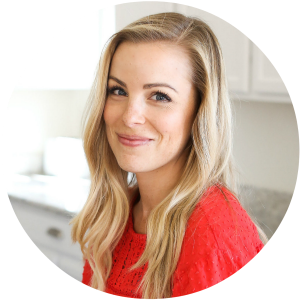 Thanks for all the great recipes Emily. Im a huge butternut fan and so is my 3yr old daughter. Im difinately going to make this for today’s sunday dinner!!! Absolutely fantastic! I love this. All I changed was I put half a cup of water and a quarter cup of honey instead of just water. It was the best I ever made! Can I use frozen? and if so should I cook it frozen or defrost it first? I have butternut squash that someone gave me. Will this taste like sweet potatoes? Lilia – I’d love to help, but I’m not quite sure what you mean…Do you mean will the squash taste like sweet potatoes? Or will this dish taste like sweet potato casserole? 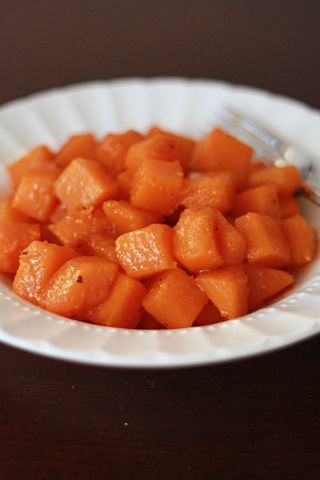 I always make sweet potatoes when I was younger what I do is just carmelize it with sugar so I am thinking maybe I will do it with the butternut squash. You have a lovely family. Thank you for sharing it . Yum! I bet you’ll love it! 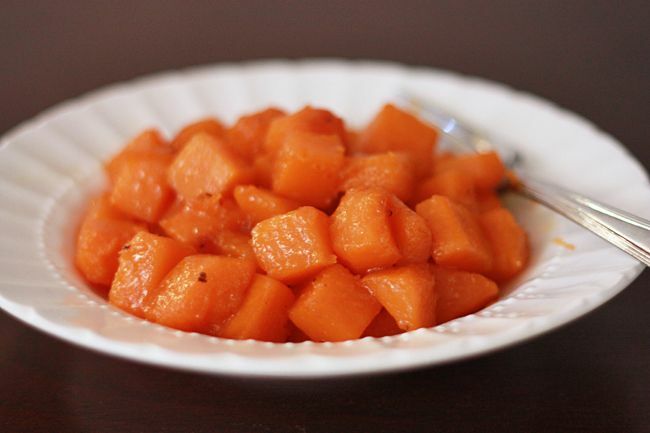 I just finished making the candied butternut squash using your recipe. It is so good. And what makes it even better tasting is the butter. I added two more tbs of sugar. Thanks for sharing. I’m SO SO glad you enjoyed it! How wonderful! I loved this! Thanks for the simple recipe! I used a drizzle honey instead of the brown sugar (since thats what I had on hand), added in some chopped candied pecans, a hefty sprinkle of cinnamon, and a bag of baby kale toward the end. Also this is just as good with a vegan buttery spread for those who aren’t eating dairy. That sounds delicious. LOVE the idea of adding greens!